Catch large grouper using pinfish, one of their favorite baits. Pinfish are small fish used as bait for snook, trout, grouper and snapper. Catching them for bait can be done with varying methods depending on the type of water you are in. Smaller pinfish work for trout or snapper while bigger pinfish are needed for large game fish like grouper. Purchase a pinfish trap or traps designed to catch the small fish live. There are a variety of designs and sizes. Base your trap on the location in which you will use it. Smaller traps are ideal to lower off a dock, larger traps may harvest more fish in deeper water. Bait the trap with carcasses from a fresh catch of other fish, halved cigar minnows, chopped mullet or sardines. The key is to use fresh raw fish. Depending on the size of the trap, use 2 to 5 lbs of raw fish as pinfish bait. Find a grassy bed area or a known trout flat, or locate the trap off a bridge piling or dock. A trout flat is a grassy area with a sandy bottom where trout are known to congregate. Trout and pinfish tend to like the same habitat, which is why pinfish are good trout bait. Sink the trap in the current flow with the long part of the trap in the direction of the current. Fish will swim in easier if the opening goes with the current rather than alongside it. If your trap is being sunk into deep water with a strong current, add a weight to the trap and float it from a buoy. Check the trap after a period of anywhere from 8 hours to a full day. The longer the trap sits, the more pinfish will likely be in the trap. Do not check the trap unless you intend to pull it or your are adding bait to the trap to keep the pinfish fresh until fishing time. Pulling the trap will distress the fish, so it is recommended that you remove them once you raise the trap from the water. Place the pinfish in a live bait well until using them, making sure there is fresh water to keep them alive and healthy. 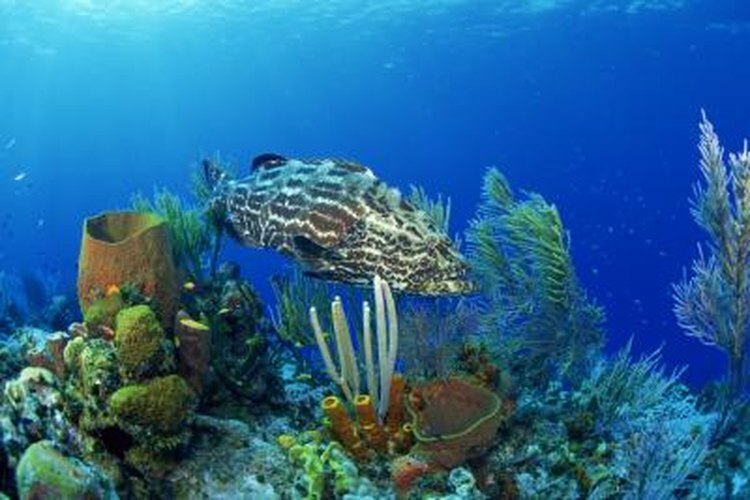 Catching grouper especially is dependent on the pinfish being active bait. Find a grassy area in the water that has a sandy bottom and would be a good pinfish habitat. You may see the silver flash of a school of pinfish in the grasses. Chum the water with raw chopped fish, catfood, or even bread. Place it upstream in the current in front of the grassy bed. Cast a net out quickly and pull it in, scooping up the pinfish. Pinfish are fast, so do not hesitate when casting or they can escape before the net is cast and pulled. Place the pinfish in your live bait well. Use a sabiki rig on a regular light tackle fishing pole out in deeper water where pinfish are known to congregate. A sabiki rig is a monofilament line with several small gold hooks set up in a row on the line attached to the main line with a swivel hook. Bait the hooks with squid chunks or parts of shrimp. Pull the line quickly when you feel a tug, pinfish are notorious for stealing bait and very quick. Do not despair, however, if pinfish are biting--there are plenty to be had and it does not take long to pull in a large number of them for bait. Place the pinfish you catch in the live well to use for catching your larger game fish. Take care handling them when removing the hook; pinfish have a row of sharp pin like dorsal fins, which is where their name comes from. Caprice Castano recently left the field of construction management to operate her own contracting business and spend time developing her writing career. Current projects include freelance writing for Internet publications and working on novel-length fiction.